Upon receiving please check that your law tag indicates made for : IZO Home Goods Please report any other fakes or copies of our product. This poly-filled pillow provides firm fluff and support. 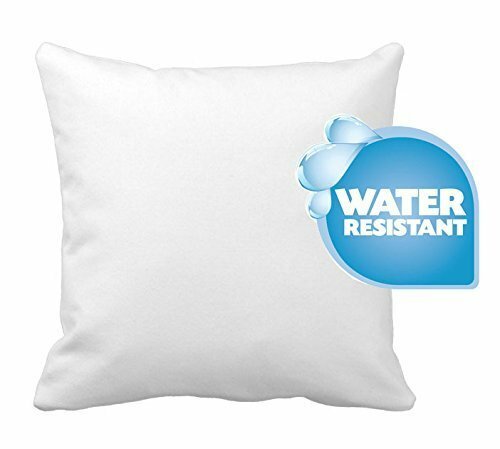 This Pillow is made of special antibacterial fabrics with waterproof coating. Fabrics treated with an antibacterial finish offer additional protection against bacteria and mold. Fabrics with antibacterial finishes may find purpose in all sorts of applications, including both indoor and outdoor environments, in hospitals and in homes. The pillow is designed large then fitting size (16x16 inches Cover), so you will end up a fluffy and full look for pillow cover. Made In USA Crafted By IZO Home Goods. New*** Outdoor - Anti-Mold Water Resistant Fabric Filled with 100% Virgin polyester non allergenic , soft and sumptuous yet firm. Resilient & Refluffable , Rejuvenate a decorative bed pillow or sofa pillow. If you have any questions about this product by IZO Home Goods, contact us by completing and submitting the form below. If you are looking for a specif part number, please include it with your message.